Do you feel like it’s been impossible to get the results you want from exercise and dieting? The truth is that most people try to get in shape with only a fraction of the guidance they need to be successful. Even if you’ve worked with a personal trainer or nutritionist in the past, chances are that any improvements you made were tough to make, and nearly impossible to maintain over time. You might have had the willpower to put in the hard work, but you might have been missing out on the knowledge, skills and support to get the most out of your effort. This isn’t your fault. Maintaining a lean, energetic and healthy body is a lifelong responsibility, but you can only be successful when you’ve unlocked the lifestyle secrets behind transforming your body. You don’t need to totally change your life by becoming a “gym rat,” or engaging in endless cardio workouts. It’s possible to make lasting and visible changes if you can commit 30-45 minutes to exercise each day, at home. 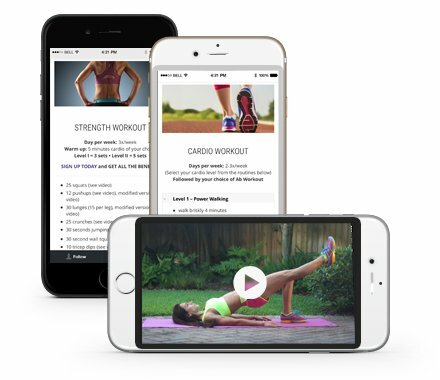 Your workouts go anywhere your smartphone goes…with built-in timers and access to an exercise video reference library. Progressive Daily Workouts – For 12 weeks, the Fit Ninja will serve as your virtual, online coach, providing weekly exercise plans covering all difficulty levels – from beginners to those seeking greater challenge. The program is designed primarily around bodyweight exercises that will help you get stronger while incorporating combination movements that fire up your metabolism unlike anything you’re used to. Plus, you access all workouts from your smartphone, so you can do them indoors, outdoors or while traveling. Are you ready to feel more comfortable in your own skin? The Fit Ninja program has given me countless lessons that I will continue to apply forever. One of the most important, is to become aware and mindful of how to eat in order to nourish my body. I also learned how daily exercise is essential for health and vitality. I didn’t need to spend hours at the gym, nor buy sophisticated equipment to reach my goals. The workouts used mostly bodyweight exercises that I could do anywhere and they were adaptable to my fitness level. By following the nutritional guidance and exercises, I was able to lose eleven pounds, which I had repeatedly attempted to lose in the past without results. I had already come to believe that I would never be able to go below 138 lbs. again. But today I’m living proof that I can! I am very pleased with the end result. Maggie, thanks for being there every day throughout the program with your guidance, encouragement and support. This program has changed my life and the life of my children. We have incorporated healthier eating habits in our lifestyle that have made an impact on our health and weight. My biggest problem was that I work long hours in a very demanding job and I am always stressed and anxious. I found myself relying on caffeine and unhealthy snacks just to get through the day. With Maggie’s guidance I am now better able to cope with stress and food related anxieties. This new eating style is easy to maintain and helped me feel at ease. I lost weight, I feel happier and I have more energy. Before the fit Ninja, I had dieted, and worked out 2 hrs a day, 5 days a week: 1 hr of cardio + 1 hr of strenuous weights. I’d get so tired I was wiped out in the afternoon and would suffer insomnia at night. But even with all that effort, I didn’t lose a single pound in 5 months…I thought something was wrong with my body. What I loved about The Fit Ninja was the personalized attention. I’m not the most disciplined person, but Maggie’s support inspired my enthusiasm and commitment, both in myself and to the program. I lost 17 pounds! My husband joined the program as well, and we both enjoyed exercising together, improving our eating habits, and setting a healthy example for our daughters. It was a great opportunity to invest in myself and start to get fitter and healthier. In this time I have achieved fitness goals that I had been trying to reach for years. Our coach Maggie is a great motivator and challenges us to always strive to push our personal boundaries to new heights. She tailors our workouts and eating guidelines to our individual needs. I highly recommend this program if you want to learn to eat better, have limited gym equipment, and have high fitness expectations. The continuous group guidance and motivation will make the process easier. You will not want the 100 days to end. After 100 days, I had surpassed my goals, and just felt amazing. I now have the fit and lean body I always wanted. Lost more than 14 pounds without going hungry or doing crazy diets, just by eating food that has positive effects on my body, and doing a 30-40 minute exercise routine, six days a week. The program changed my body, my way of looking at food, improved my health, and not only for 100 days, but for life. After starting, you do not want it to end. I’m very grateful to The Fit Ninja for helping me reach my goals, and make such a positive and permanent impact in my life. Tired of not seeing progress? Every week, I’ll provide you with an online exercise plan designed for fat-burning and strength-building. These constantly-changing bodyweight workouts can be completed at home with little or no equipment. And daily check-ins will keep you on track. Still confused about fat, carbs or calories? I’ll help you understand how your diet affects hormone balance, so you can master cravings and boost your body’s fat-burning capabilities. Based on the latest science…with ZERO starvation. You get the support you need to succeed. You’ll have access to other program members via web and chat to keep each other inspired. Plus, you get direct access to the Fit Ninja – your daily motivator, coach and advisor – so you keep making progress toward your best body ever.